Harrison Council for the Arts presents “Horizon Lines” a series of (mostly) long landscape paintings by Elizabeth de Bethune at the Harrison Public Library, Halperin Building, 2 Bruce Avenue, Harrison, NY on view February 4 to 24; meet the artist February 10 from 2 to 4pm. ARTIST’S STATEMENT: These landscapes primarily depict places I’ve travelled to recently, and as such are a kind of love poem, or homage, to the enchantment of being in a new place, and a way to understand and communicate how it feels. In each of these images, I feel that I am responding to what resonated about that particular place; what pulled me into its poetry and inspired me to grapple with it compositionally. As a New Yorker who loves the Hudson Valley, I appreciate magnificent landscapes but long for open spaces. 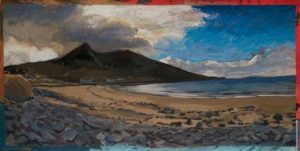 Images of Alaska, the Southwest and the west coast of Ireland address that desired feeling of expansiveness; they are really very much about standing in one spot and feeling the vastness of distances beyond my outstretched arms. Ms. de Bethune studied painting at Yale, and received an MFA in Drawing and Painting from SUNY Purchase. She has also worked extensively with monotype printing, especially at fellowships at Women’s Studio Workshop, and workshops at Center for Contemporary Printmaking and Vermont Studio Center. She has exhibited extensively in the tri-state area and beyond.